Ross Rubin contributes Reserve Power, a column focused on personal perspectives and products. Last week's Reserve Power introduced six handset stands for propping up your miniature movie theater. This week's column takes on a half-dozen more, names my favorites, and concludes with a chart detailing which phones fit which stands. In the world of handset stands, Peter Parker might be inclined to go for the Spiderpodium, but Batman would no doubt want to tuck the rugged, rubbery iZel into his utility belt. When in its flat travel position, the iZel's widebody profile looks like a bird or bat (particularly the black and gray version above). 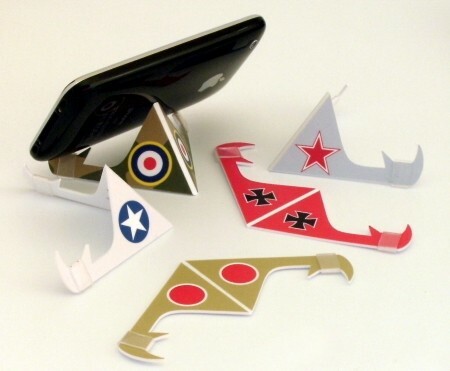 The "wings" – which include small locking pegs -- fold in to form the cradle of the device in one of two positions that are optimized for portrait mode or landscape mode for larger devices. A third sliding leg offers a nice array of tilt adjustments for different viewing heights. 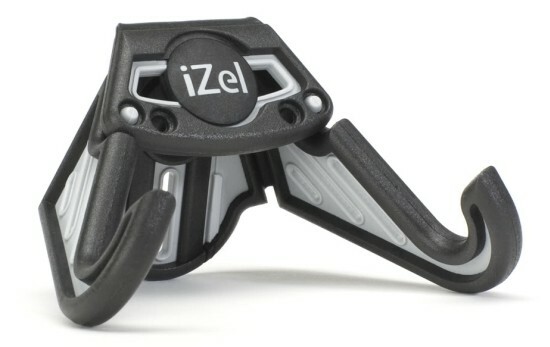 The iZel was one of the most capable stands tested, one of the few that could accommodate everything from the tiny HP Veer to a Motorola Xoom. Incidentally, if you pick up a few iZels, they can be used to play a pretty challenging game of Barrel of Monkeys. 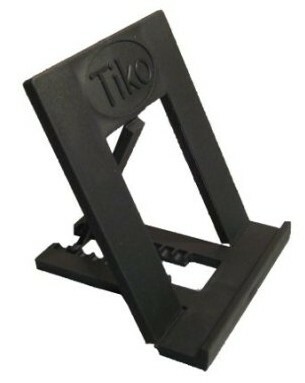 Hailiing from the UK and looking a bit like a miniature grappling hook, the small but mighty and very cheap Seskimo Crabble is a deceptively simple folding piece of plastic that looks like it could barely stand up by itself -- much less hold the weight of some of the largest smartphones on the market. Incredibly, it handled every phone thrown at it in portrait and landscape orientation, topping out at a 7" BlackBerry PlayBook in landscape mode. There's no adjustable angle, but it is so small and thin that it easily slips into a wallet's credit card pocket. Lumi's iStiki is a smooth operator, but only a smooth operator. The product consists of two stacked rotating cylinders that collectively resemble a tall marshmallow. On each cylinder is a suction cup. The iPhone sticks to one, while the other is affixed to surfaces such as glass tables, tiled walls, monitors, windshields and even some dashboard surfaces. As such, it's one of the best products to use with car navigation apps on the iPhone. It's also handy for sticking an iPhone or MiFi to a window to improve cellular reception in a mobile hotspot scenario. The backs of most other handsets did not stick very well, though interestingly, the iStiki also has a tripod screw hole on its bottom. This makes it more useful for capturing photos or video as the iStiki works well with the glass surfaces of many touchscreen handsets that use the screen as the viewfinder during recording sessions. Simple and slim but with a relatively spacious back support, the Tiko Fold is a large rectangle with a small lip at the bottom. Pieces of its middle fold back to create a support that includes nine adjustable positions, the most prospective resting angles of any stand tested. Along with the iZel and bulkier but narrower 3feet, the Fold was the few pocketable stands of the lot that could handle an iPad and Xoom, although the prospect was a bit dicier when dealing with the higher center of gravity of those tablets in portrait orientation. Right out of the box, the clever iCarpus can grab you... literally. 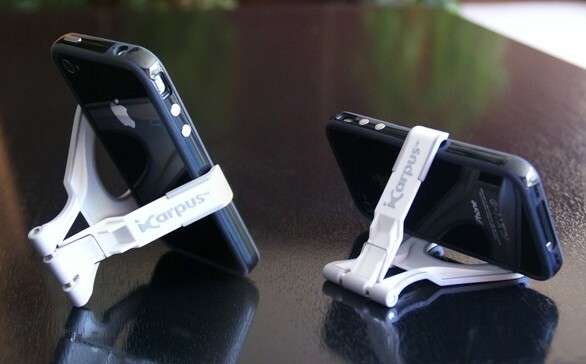 Taking a different approach from stands that feature grooves or lips to form a resting surface, the iCarpus uses a spring design and a pair of jaws that stretch wide to cradle the sides of a device. It accommodate handsets even when in cases. Without its jaw unopened, it lies flat, and even doubles as a headphone wrap. The one potential disadvantage is that, in portrait orientations, the bottom of the device will touch the surface on which it's resting. The iCarpus can be ready to go faster than other stands that require setup. Its limited jaw reach can't accommodate even small tablets, but it was able to grasp the 4.5-inch Samsung Infuse. Because of its large size relative to the other stands, I didn't include the In Your Face as a contender for best pocketable phone stand. However, it's definitely worth considering for a few scenarios. 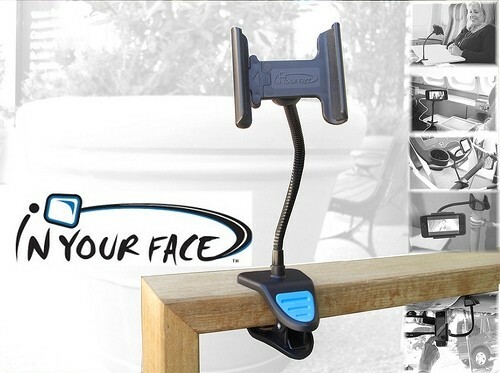 Consisting of a phone clamp at one end and a spring-based grasp at the other end joined by a gooseneck extension, the In Your Face can grab on to a variety of surface edges to raise your handset and bring it closer to a comfortable viewing angle. It is also a great product to stabilize a phone for taking photos and videos, and for video chat. The company's Web site shows how it can be an aid for those in wheelchairs or who may face other challenges getting a handset to a comfortable level and the company is planning a variation that allows handsets to be suction-mounted to windows. And the winners? For its versatility, amazing performance, brilliantly simple design, low price, and simply being the only stand tested that can fit into a credit card walllet pocket, the Seskimo Crabble emerged as my favorite. Among the larger pocketable stands, I liked the Movaic iZel and Tiko Fold best for their ability to tilt in increments and efficiently deal with large devices, with the nod going to the former. I also admired the Visual Factor iCarpus, which maintains a thin profile and can be used as a headphone wrap (although those who care mostly about fitting the iPhone should also be happy with the simpler iAngle). The Breffo Spiderpodium may be able to put your handset in places other stands can't, but it's a bit too ungainly to carry everywhere. Finally, the elago M1 is a good choice for those who don't care much about portrait orientation and want something they can keep on their keys. If you'd like to check out the spreadsheet in which I tracked which handsets worked with which stands, you can see it here. Ross Rubin (@rossrubin) is executive director of industry analysis for consumer technology at market research and analysis firm The NPD Group. Views expressed in Reserve Power are his own.